The Top Loading Minifile cuts floor space requirements up to 67%! 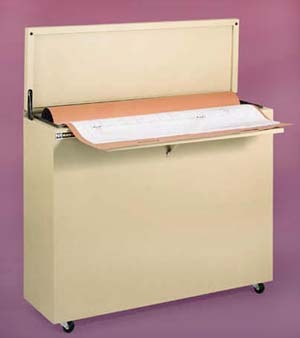 Offers the fire resistance and water resistance of the Planfile but in a unit of smaller capacity. For user's where floor spaces is at a premium, The Mini file can be a real problem solver. Available in one of six fine grade powder coated finishes. See color chart at bottom of page. With this system there's no need for temporary aisle way detours. Filing is done from the opened top. Flat File drawers require at least 50 inches directly in front of the cabinet. The Minifile requires only enough space for the operator to stand. 6024 35 1/2" 43 1/4" 14 3/4"
6030 40 1/4" 49 1/4" 14 3/4"
6036 44" 55 1/4" 14 3/4"
* Minifiles ship via freight services.